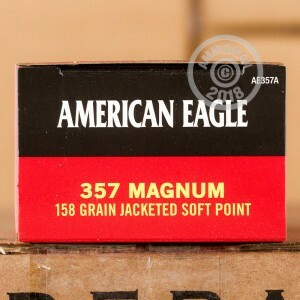 This .357 Magnum is a versatile revolver or rifle load capable of punching holes in paper targets and varmints alike. 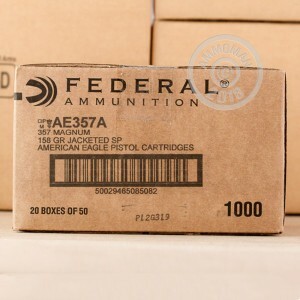 Manufactured by Federal Premium Ammunition of Anoka, MN, these cartridges fire a 158 grain jacketed soft point bullet that delivers good expansion against soft targets without excessive fragmentation or overpenetration. 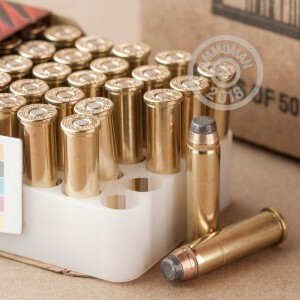 These cartridges use non-corrosive Boxer primers and brass cases and come in boxes of 50, with 20 boxes to a case of 1,000. Order this case today (or any other items totaling $99 or more) to get free shipping from AmmoMan.com!